Find your all-time favorite food and drinks at Jimmy Geez in Haledon & Oak Ridge, New Jersey locations. We serve 24 draft beers and Buffalo wings, among our laid-back selection of food and drinks that fit any day or night of the week. All our items are available for take-out - call Haledon at 973-790-9729 or Oak Ridge at 973-697-4339 to place your order. Let us cater your next party or event! Click the image below to view our full catering menu. Why don't you let Jimmy Geez take care of next party or celebration? 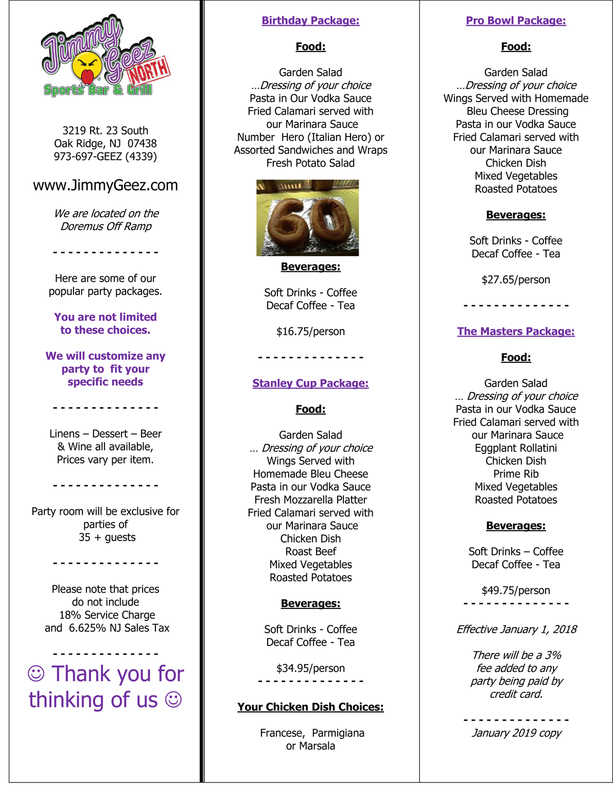 At Jimmy Geez North we offer a full in-house catering menu for all your entertainment needs.